Harris Performance has unveiled a road-going replica of the XR1200 race bikes – before the UK series has even started! 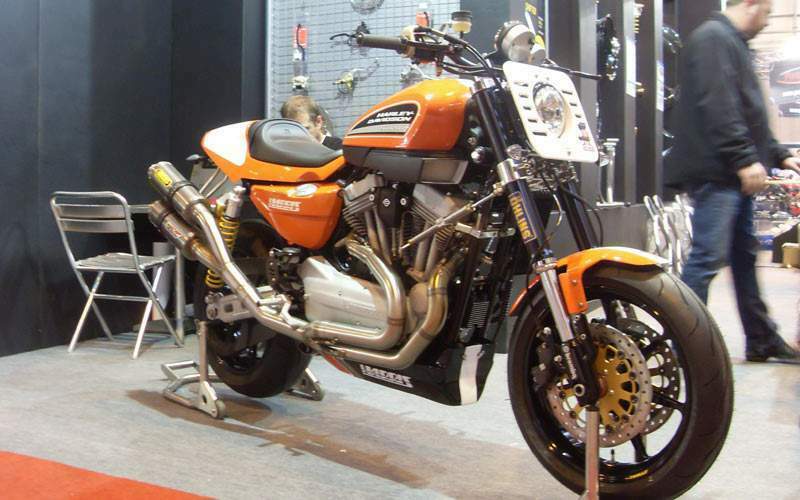 Get all the latest NEC Show news The XR1200 replica is kitted with a full Harris Performance 2-1-2 race exhaust system, Dymag 17” race wheels, Öhlins rear shock absorbers and a Brembo radial-pump brake master cylinder. A steering damper stops the wide handlebars from shaking over bumps. Harris has fitted the Harley-Davidson XR1200 with a single race seat cowl is fitted over the standard seat, and a front numberboard is fitted with a hole cut for the standard headlight. Brembo discs are fitted, and Dunlop Qualifier RR tyres are fitted to give it the grip to match the performance. Rearset footrest keep the foot pegs away from the floor, and a race-style catch tank belly pan is fitted for the right look – hopefully the motor isn’t likely to spill its guts on the road!